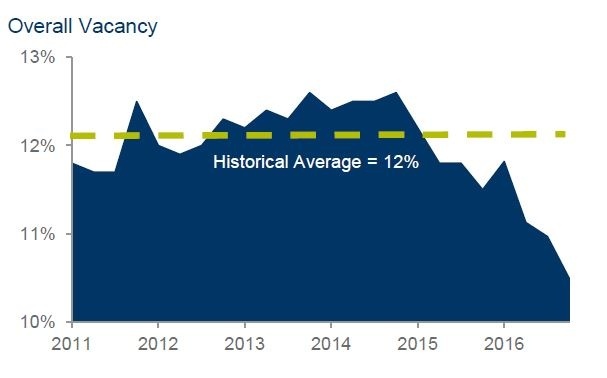 Improvement is aided by continued restraint in new, speculative construction which will require an extended period of increasing rent to reignite. The year-over-year change represented the largest improvement recorded since tracking the market began in 2005. 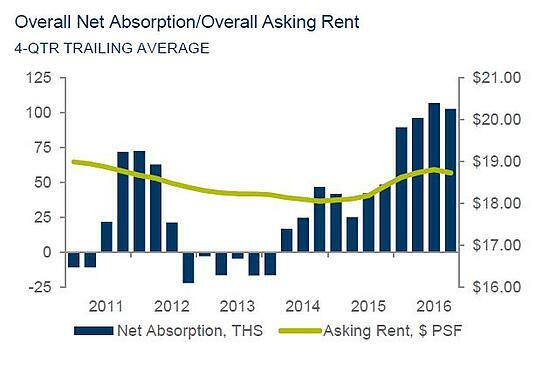 Absorption for the year of 410,888 square feet (SF) exceeded the prior two years. Activity in 2016 centered in the sectors of medical, behavioral health and financial services. Sales activity in 2016 reported wide-ranging pricing, cap rates, financing and valuations, primarily due to disparate motivations. As the year drew to a close, the top four closings were by investors, and most user purchases were for medical uses. Development and re-development continued in downtown Tucson, with the AC Marriott, City Park, and a new vision for La Placita Village. Elsewhere, a 10,000-SF medical office building at Houghton Town Centre began construction for a user and a speculative shell building at Magee Corporate broke ground. Development plans for the former Townsend school site at Craycroft and Grant are underway, anchored by Pima Medical Institute. The pace of activity is expected to continue to accelerate thanks to optimism from all stakeholders fueled by both internal expansion and external interest in the Tucson office market. Tightening inventory has resulted in rent pressures in select niche markets. Lease rates are expected to report movement market-wide when vacancy improves to 8.0 or 9.0%. Re-development opportunities will grow to turn around lower-end, Class C buildings. More medical openings will occur in the first quarter, with Tucson Medical Center opening its Rincon Health campus, Health on Broadway downtown with El Rio, and its new Women’s Center on the main campus. Lastly, increased activity from legal and financial services is expected to continue in 2017.